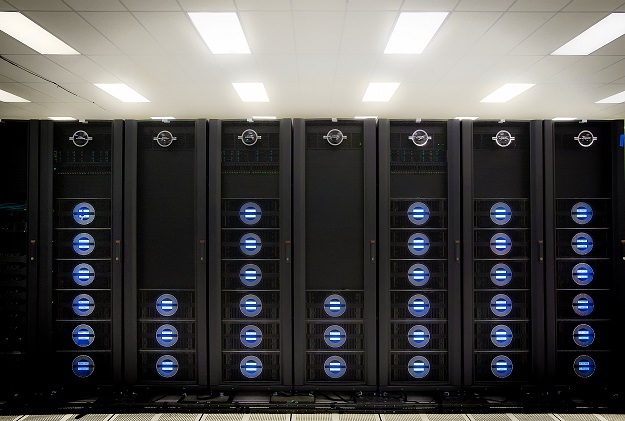 NERSC’s Cray Sonexion system provides data storage for its Mendel scientific computing cluster. In my previous blog post, I discussed the need for parallel I/O and a few paradigms for doing parallel I/O from applications. HDF5 is an I/O middleware library that supports (or will support in the near future) most of the I/O paradigms we talked about. 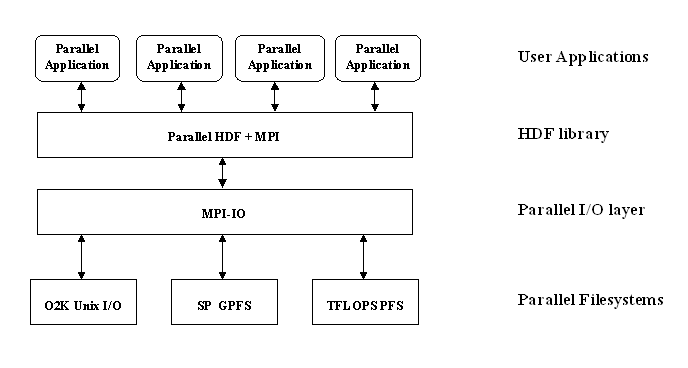 In this blog post I will discuss how to use HDF5 to implement some of the parallel I/O methods and some of the ongoing research to support new I/O paradigms. I will not discuss pros and cons of each method since we discussed those in the previous blog post. But now back to our topic. Parallel I/O methods that HDF5 currently supports: Let’s start with the simple one file-per-process method, where each process creates and accesses a file that no other process is going to access. In this case, the application will program its I/O similar to a serial application, but has to make sure that the file names created between all the processes are not the same. For example, process with rank 0 will access file_0, rank 1 – file_1, and so on… Any VFD can be used in that case to access the files. The file-per-process is an extreme variation of the more general multiple independent files (MIF) method, where each group of processes accesses independently a single file. The application is programmed such that each process gets a baton giving it a turn to write to the file. When it’s done, it closes the file and passes the baton to the next process in its group. Another extreme variation is to lump all processes in one group making all access done independently to a single file. The overhead of each process opening, closing, and passing the baton could be bad and not scalable on some systems though. The default SEC2 VFD is typically used in that case, but again, any VFD could be used. Performance Tuning: Using parallel I/O is one thing, but getting good performance from parallel I/O is another thing. There are many parameters that govern performance and it’s hard to cover them all, but instead I will mention the ones that should always be kept in mind when tuning for performance. OMPIO, an Open-MPI native MPI-I/O implementation, allows setting those parameters at runtime using OpenMPI’s runtime MCA parameters in addition to setting them through info hints. Chunk size and dimensions: If the application is using chunked dataset storage, performance usually varies depending on the chunk size and how the chunks are aligned with block boundaries of the underlying parallel file system. Extra care must be taken on how the application is accessing the data to be able to set the chunk dimensions. Currently however, at the HDF5 level, there are still some issues that cause performance bottlenecks and most have to do with the nature of the small metadata I/O generated by HDF5. The upcoming HDF5 1.10 release should address many of those limitations. (Click here for more information on the upcoming release). A more detailed discussion of those limitations and what we are doing to access them are a subject of a future blog post, so stay tuned on that front! HDF5 in the Future: The near future of HDF5 should have releases addressing many of the performance bottlenecks that the current 1.8 release has. Also, new API additions are introduced for faster and more convenient file access. But there are still new parallel I/O paradigms that HDF5 doesn’t support. Current research projects that The HDF Group is leading or involved in include adding support for I/O forwarding capabilities in HDF5. Using an RPC library called Mercury, we can issue HDF5 calls on one machine and have it be executed on another machine. In an HPC system, the source call would be a compute or analysis node, and the destination would be an I/O node or storage server node. Another synergic topic is tiered storage architectures with “Burst Buffers” that are gaining more traction to be the norm for Exascale systems. HDF5 will need to undergo major changes to the data model and file format to fully leverage such systems. Research has been done (and is ongoing with the DOE Exascale FastForward projects) on how to incorporate concepts such as data movements, transactional I/O, indexing, and asynchrony to HDF5. In summary, there is a lot of work to be done, but the future looks bright for parallel HDF5!presenting a poster (click zip file to download). Figure 1: Molecular dynamics simulation: Example of a molecular dynamics simulation in a simple system: deposition of a single Cu atom on a Cu (001) surface. Each circle illustrates the position of a single atom; note that the actual atomic interactions used in current simulations are more complex than those of 2-dimensional hard spheres. https://en.wikipedia.org/wiki/Molecular_dynamics Image: Kai Nordlund, professor of computational materials physics, University of Helsinki. In particular, I wanted his thoughts on how we are leveraging HDF5, and whether we could be doing it better. The discussion gave me plenty to think about going forward, but it also put me in contact with some of the other folks involved in the Python ecosystem surrounding HDF5. Long story short, I was asked to share how we were using HDF5 with a guest post on the HDF Group blog. First a bit of background. At the Beckstein Lab we perform physics-based simulations of proteins, the molecular machines of life, in order to get at how they do what they do. These simulations may include thousands to millions of atoms, with the raw data a trajectory of their positions with time, which can have hundreds to millions of frames. Simulation work often proceeds organically, starting with exploratory simulations with “reasonable” parameters, the results of which inform our next set of simulations and the questions we think we can answer with them. As this process continues, we generate an increasing number and variety of raw trajectories, as well as derived datasets. These datasets can include distances between particular atoms with time, time-averaged spatial densities, radial distribution functions, and anything else we might be interested in. Data from many simulations may be aggregated to build quantitative models, such as Markov state models. Special sets of simulations may also be performed to calculate specific quantities, such as free energies of ligand binding. Figure 2: Escherichia coli NhaA transports sodium ions across the bacterial membrane using the free energy provided by the electrochemical proton gradient the cell spends a significant amount of energy maintaining. The protein is thought to undergo large-scale changes in shape to transport these ions, though the precise details of this process are not yet known. The protein is displayed here in two states, with the ion binding site exposed to opposite sides of the membrane. The extent of the membrane in which the protein sits is indicated with dotted lines. We run simulations to examine phenomena that emerge from complexity, but the size, number, and variety of simulations we produce add another layer of complexity that we have a hard time managing. We need to be able to easily sort through the simulations we have, retrieve the datasets we want to explore, and write analysis code that can work across many variants to produce new datasets, ultimately answering biological questions. How can we do this? MDSynthesis (MDS) is our answer to this problem, using and abusing HDF5 so we can focus on the science and less on the problem of data storage and curation. MDS gives Treant objects that make storage of pandas objects (Series, DataFrames, Panels) and NumPy arrays as convenient as possible, writing them persistently to disk in individual HDF5 files. Treants live as directory structures in the filesystem, with identifying attributes such as tags and categories (key-value pairs) stored persistently to disk in a state file that is itself HDF5 and managed with PyTables. Figure 3: A Treant is a receptacle for data sets. In addition to storing data, Treants can also be differentied with a name, tags, and categories. Treants exist in the filesystem as a directory structure with a single state file and individual directories for each data set. They are named for the walking, talking trees of D&D lore. For individual simulations, we use a type of Treant called a Sim. These can store additional details such as filepaths for use with MDAnalysis, a domain-specific Python package for picking apart the details of raw MD data. A Sim can also store atom selection definitions, making it easier to write analysis code that works across many simulations even if the details of the selection differ among them. For aggregating the results of many simulations, we use a Group. This Treant can keep track of other Treants (including any mixture of Sims and Groups) as members, and adds convenience methods for mapping operations on its members in parallel and aggregating their stored datasets. MDS is a pragmatic tool that is enabled by the flexibility of HDF5, and has greatly improved the speed with which our lab does its work. What’s more, because of its distributed nature (no daemon required, independent objects), it allows us to work with increasingly large datasets without having to set up complex infrastructure. The approach isn’t without its drawbacks, but the advantages are many. It wouldn’t be possible without the versatility and performance of HDF5 and its interfaces in the Python ecosystem, in particular PyTables, h5py, and pandas. Note: Recently as of this writing, the core components of MDSynthesis have been split off into a package called datreant to be of greater use to domains outside of MD. For any field that works with experimental or simulation data, the package can be used as-is or as a base package for more domain-specific persistent objects. It is still in early development, but already usable. Also, note that there is a lot of historical use of the word “Container” in the docs for MDSynthesis; the word now used is “Treant” to avoid confusion with completely unrelated technologies that are in common use (e.g. Docker). Thank you so much, David! We loved hearing about your work. Ideas for guest blogs from others are also welcome – email us at blog@hdfgroup.org.